Steed is brushing up on genealogy, and finds he is of royal blood—barely. When a key witness is nearly murdered, Steed is called upon to provide protection. But the ones who want her dead devise an incredibly elaborate and devious means to extract Steed's whereabouts from Tara—which involves bombing Steed's flat and killing Mother! Not bad, really. 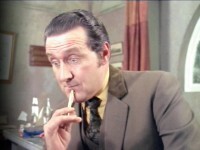 The scheme to dupe Tara is well devised, and the scenes with Steed matching wits with Miranda are cute. What's missing is a mastermind, someone to boo. For those keeping tabs on when Steed carries a gun, you can chalk this one up on the list—Tara even takes notice of it. Steed's Aunties (in a manner of speaking): Steed has an uncle who is a chess grandmaster and a cousin named "Demon Desmond" who is the world Ludo champion. Letchmore Heath and Totteridge Village provided location settings. 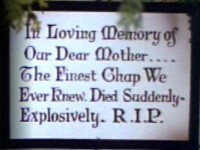 The enemy agents arrive at the "safe house" expecting to find Steed, but instead find Mother and Rhonda, the latter taking them out in grand style. Miranda learns that Steed's cousin is Demon Desmond, the world Ludo champion, and exclaims, "Groovy, baby!"